If you’ve never heard of Michael Gulezian (gu-lay-ze-in), you’re in for a very pleasant surprise. 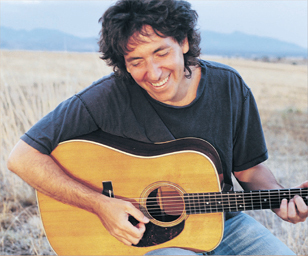 He’s one of the most highly regarded instrumental acoustic artists of our time. In concert, Michael is all warmth and humor … and though it’s visually breathtaking to watch him perform, a concert with Michael is more than a display of cutting-edge virtuosity – it is the passionate communion of master musician engaged with his audience in the mystery of self-revelation, creating music of atmospheric power, ecstatic joy, and haunting beauty. If you enjoy the artistry of musicians such as Leo Kottke and Michael Hedges – guitarists who amaze us with what ten fingers and one guitar can do – then you will love Michael Gulezian.